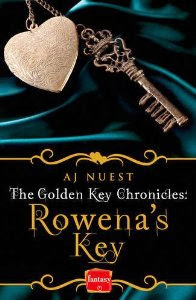 Today is the launch day of Rowena's Key, the first in the Golden Key Chronicles by A J Nuest. I reviewed this novella yesterday and absolutely loved the fantasy romance about an antiquarian named Rowena, who discovers a prince on the other side of the mirror in her armoire. You can find my review of Rowena's Key here, but to celebrate the launch today, I am very excited to share an extract from Rowena's Key. A big thanks to A J Nuest for allowing me share this preview with you. Rowena's Key was published by HarperImpulse on November 7th 2013 and is available from Amazon and Amazon UK. About the A J Nuest: I am a multi-published, award-winning author who lives in the middle of a cornfield in NW Indiana. My loving husband, two beautiful children and a bevy of spoiled pets have agreed to stay and, in exchange for three rations per day and laundry service, tolerate my lunacy. While I spend most days happily ensconced in crafting romance across a multitude of genres, an underground coup has been percolating. The dogs just informed me the cat is secretly vying for dictatorship. You can connect with A J Nuest via her website, blog, Facebook Page, Twitter, and Pinterest. And you can find my review of Rowena's Key right here on Love Reading Romance.